LOS ANGELES, Oct. 1, 2018 /PRNewswire/ -- With a blast of the locomotive's horn and a shower of biodegradable confetti, the Los Angeles – San Diego – San Luis Obispo (LOSSAN) Rail Corridor Agency and the California Department of Transportation (Caltrans) introduced new, cleaner locomotives to the Amtrak Pacific Surfliner service today at Los Angeles Union Station. State and local officials in attendance had an opportunity to step aboard one of 14 new Charger locomotives that will begin operating starting this fall. The Charger locomotives, manufactured by Siemens, will power the next generation of Pacific Surfliner trains between San Diego, Los Angeles and San Luis Obispo. "The production and delivery of new locomotives and railcars does more than provide an environmentally-friendly way to travel around the state," said Brian Annis, Secretary of the California State Transportation Agency (CalSTA). "It also directly employs more Californians in well-paid jobs, while indirectly generating more jobs throughout the state's economy." The Charger is the first passenger locomotive to receive the stringent Tier IV emissions certification from the Environmental Protection Agency, making the Charger one of the cleanest diesel-electric passenger locomotives currently in operation. California is leading the charge and is at the forefront of low-emission rail vehicles. "These locomotives were proudly produced by the 1,300 Siemens employees who work in our solar-powered plant in Sacramento, California, one of the most well-established, comprehensive manufacturing facilities of its kind in the country," said Michael Cahill, president of Siemens Rolling Stock in the U.S. "Siemens is grateful for the opportunity to work with Caltrans and is proud to be a part of their efforts to provide clean and efficient transportation for the state of California." The 14 locomotives were funded by Caltrans with approximately $100 million in state, federal and local funds, and will replace Amtrak-owned locomotives which are nearly 20 years old. "I'm excited for these new locomotives, which will provide safe, clean and reliable passenger rail service in Southern California," said Caltrans Director Laurie Berman. "I'm very proud of partnerships like this – working together helps Caltrans do more for the mobility of Californians." With 24 daily trains providing service along the Southern California coast, the Pacific Surfliner offers an attractive and environmentally-friendly transportation alternative that helps relieve congestion on adjacent freeways like Interstate 5 and U.S. 101. "The Charger locomotives are almost 90 percent cleaner than the locomotives they will be replacing, and their 4,400 horsepower engines are more powerful and reliable too," said Bryan MacDonald, chairman of the LOSSAN Agency, which oversees the Pacific Surfliner service. 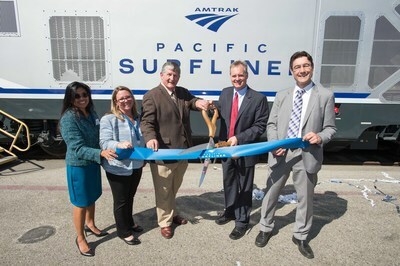 "These locomotives will allow us to expand Pacific Surfliner service to meet growing ridership demand while also significantly reducing emissions in the communities we serve." For more information, please visit news.PacificSurfliner.com. Caltrans manages more than 50,000 miles of California's highway and freeway lanes, provides inter-city rail services, permits more than 400 public-use airports and special-use hospital heliports, and works with local agencies. Caltrans carries out its mission of providing a safe, sustainable, integrated and efficient transportation system to enhance California’s economy and livability.